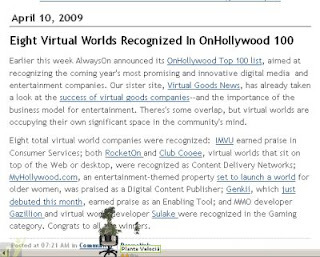 "both RocketOn and Club Cooee, virtual worlds that sit on top of the Web or desktop, were recognized as Content Delivery Networks". Weblin should have been there and would have been there. But thanks to a "great manager" and investors who believe in advertisements and not in virtual goods, weblin is at least 1 year late with virtual goods. The no show of weblin's CEO at the Engage! Expo panel was probably not very helpful either. Weblin was the first world layered over the Web. It was always meant as a complete virtual world on the Web with people and virtual objects. See an extensive report on Virtual Goods News about weblin's original plans. Now RocketOn takes the prize, and they earned it by doing the right thing.